On an afternoon hike, this handsome male wood turtle (Glyptemys insculpta) made his presence known. The rings of a turtle’s scutes can be used much like the rings of a tree. If you count them, you can learn the age! This particular wood turtle is about 13 years old. We measured and marked him, then let him carry on about his business. Wood turtles are a species of special concern, so seeing this fellow was a real treat. 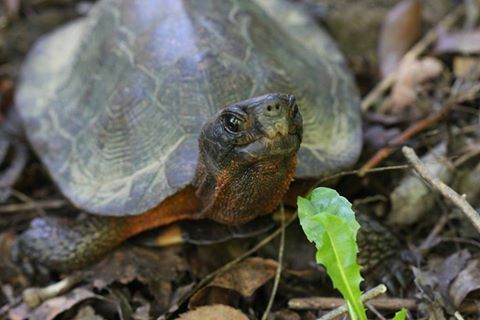 Because they are semi-aquatic and spend parts of the year on land and other parts in the water, wood turtles are affected by habitat destruction, farming, water pollution, traffic, and the pet trade. Keeping their natural habitat clean and letting them live their lives in nature are great ways you can help wood turtles. Lauren Peele Horner is a naturalist and educator at Powdermill Nature Reserve, Carnegie Museum of Natural History’s environmental research center. Museum employees are encouraged to blog about their unique experiences.